February 11, 2014 (ATN) - What may have seemed like an isolated incident perpetrated by one of the more unsavory supporters of the current regime of accused mass murder, convicted criminal and fugitive, Thaksin Shinawatra, now appears to be more systemic - the abuse, mockery, and neglect of Thailand's handicapped. It was reported in "Senior Reuters Journalist Mocks Disabled Man," that pro-regime propagandist Andrew Marshall formally of Reuters, shamelessly mocked a double amputee. The tasteless hate speech went uncondemned by the many Western media outlets that defer to him as an "expert," in a pattern of emerging contempt the regime and its supporters exhibit toward the people of Thailand. 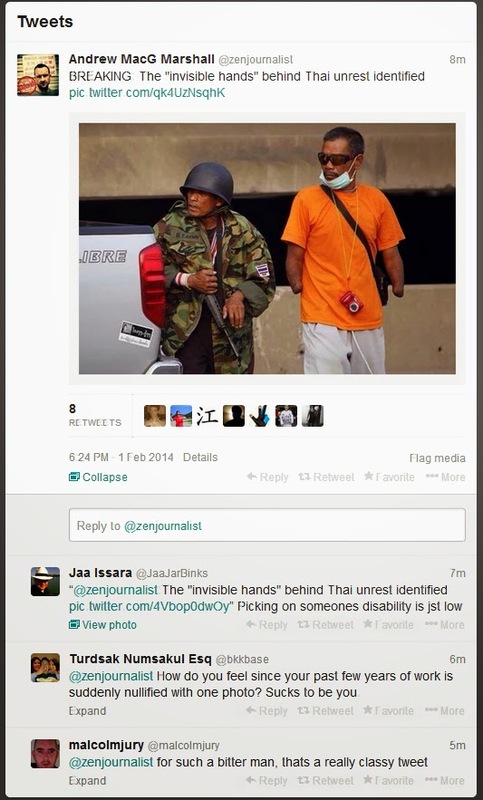 Image: CNN, BBC, and Foreign Policy magazine have all cited or afforded space to Andrew McGregor Marshall, a pro-regime paid propagandist working for Thaksin lobbyist Robert Amsterdam, who daily engages in hate speech like that seen above - mocking a disabled man. With the Transportation Ministry now reneging on their promises to purchase wheelchair accessible buses, it appears that disregard and disrespect toward Thailand's handicapped is as systemic across the regime as corruption and incompetence. In yet another indication of the absolute contempt the regime holds the Thai people in - contrary to their "populist" facade - the Transportation Ministry had promised to purchase buses that were handicap accessible only to continue pursing their original, ill-conceived contract to purchase ordinary buses which will provide little or no access. Image: The regime's contempt for the handicapped in fact started back in November, where a public hearing regarding the purchase of inaccessible buses was held in a public building inaccessible to the disabled people attempting to petition the regime. 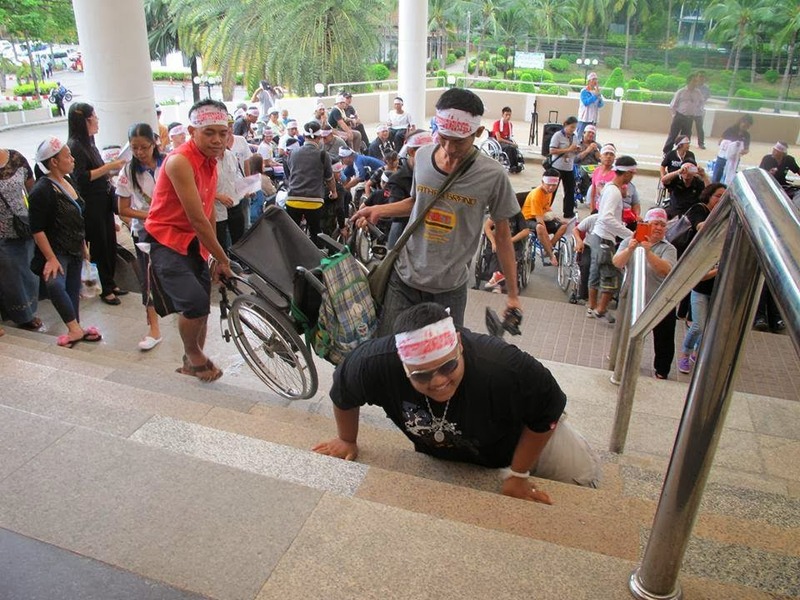 Activists were forced to crawl up the stairs - much like rice farmers are now being forced to come to Bangkok and beg for subsidies promised but never paid by the regime. An inexcusable pattern of absolute contempt for the very people the regime is supposed to be serving has clearly emerged. ASTV's Manager news service reported in their article, "Handicap Assembling to Protest Purchase of Unaccessible Buses (title translated from Thai)," that handicapped activists must once again assemble to protest the purchase of new city buses they were promised would be accessible, but are clearly not. The regime, just like it has done to students promised free computers, and rice farmers promised generous subsidies, has lied to Thailand's handicapped simply to buy time and proceed with corrupt, incompetent policies. Protest coordinator Arpanee Mittong rebuked the regime's excuse that the contracts were already made and couldn't be changed, stating that the contracts were to be paid by tax money and that the purchases should benefit the greatest number of people. With other nations across the globe finding the exclusion of their handicapped from mass transportation not only abhorrent, but an intolerable violation of basic human rights, one must wonder why the regime didn't think of handicapped accessible buses in the first place - and why an activist group even needed to put pressure on them to make the right decision. For now, the "Occupy Bangkok" protests, which have attracted wide support across all of Thai society, including cheated rice farmers, have yet another betrayed and trampled segment of the population to fit among their ranks. It will be difficult for the regime and its Western backers to continue calling the protesters a "minority" lined with "Bangkok elitists" with the growing diversity being assembled beneath their banner. For now, the best those concerned with the plight of Thailand's handicapped can do, is raise awareness of this intolerant, abhorrent violation of human rights, and demand the regime of Thaksin Shinawatra be exposed and condemned for yet another abusive and corrupt policy.